who makes some of the most beautiful handmade cards. 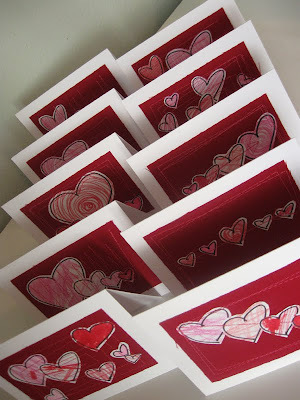 I must confess that I don't love Valentine's Day crafts all that much. Don't get me wrong, I am a big fan of Valentine's Day itself. Anything that inspires warm fuzzy feelings and maybe even some dark chocolate is a good holiday in my book. But the crafts...eh. The one exception to the rule is actual Valentine's cards. I just love getting and sending mail, so this is right up my alley. Having some blank cards & envelopes laying around, I set to work to make some snail mail love for friends and family. I used a Sharpie to draw a whole bunch of hearts on paper and the boys and I colored them in with the appropriate pinks and reds. 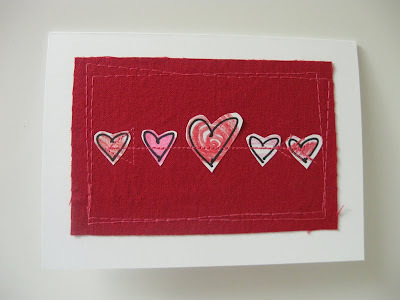 Then I used a glue stick to put a piece of fabric on each card and then glued various hearts to the fabric. 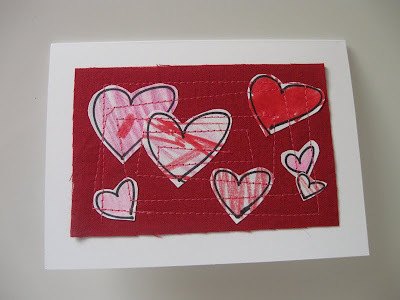 When the glue was dry I sewed the cards. Of all the materials I've sewn, I've never done paper. And, let me tell you, it is a great thing to sew. they're even cute on the inside! Wow, thanks for the nice complement(I think that was for me, anyway:)Hugs to you too! What adorable cards you and the boys have made. I have always liked the look of sewn paper. You have inspired me once again. Is it already-almost Valentine's Day? I'd like to invite you to visite my italian blog (on the column on righ there is the link for transalte my blog in numerous languages), bye bye Laura! Hey Wendy, my best advice is a brand new super sharp needle to avoid skipped stitches. 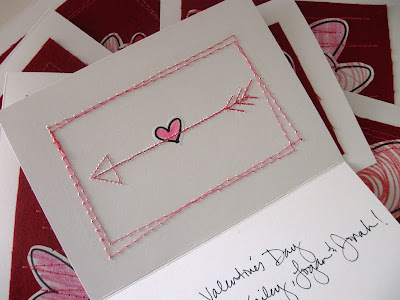 Denim needle on cardstock is best. if that doesn't do it, play with your bobbin tension and upper tension. Good luck!